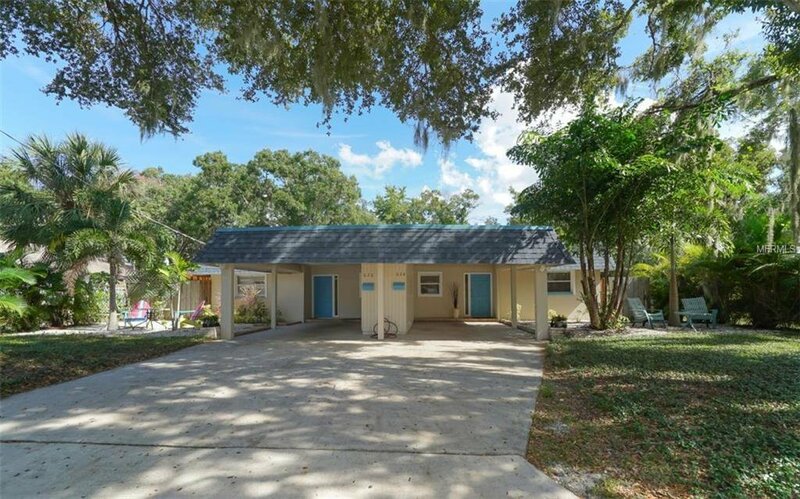 Duplex for Sale in the Historic Gillespie Park neighborhood within easy walking distance to downtown Sarasota, the cultural district and the Bayfront. A nice 2BR/1BA on each side of duplex with private lanais and private backyards – one backyard is very spacious with extra storage sheds and fence that slides open. Each side has its own laundry area with washer and dryer provided. Each side has a covered carport. The lot is one of the largest in the neighborhood at 10,300 sq. ft. Many improvements have been made in the last few years. They include: New HVAC's on each side of the duplex with the most recent installation in 2018, Wood privacy fence installed around entire backyard including a 16 foot sliding gate and concrete paver tiles in both lanais and on sidewalk areas, New landscaping and large trees have been professionally pruned and new attic insulation added in 2017. The duplex has been painted inside and outside, New roof shingles, New water heaters were installed in 2014 on both sides of the duplex and two secure outside storage sheds have been built on the property. Each side of the duplex is ready for buyer occupancy and/or short or long term leasing. So convenient to downtown and is about 2 blocks from the Gillespie Park which is a 10 acre city park with a playground, tennis/pickle ball courts, pond, walking paths, basketball court, butterfly gardens and Paws Park. Don’t miss out on this excellent opportunity. Listing courtesy of COLDWELL BANKER RES R E. Selling Office: PREFERRED SHORE.